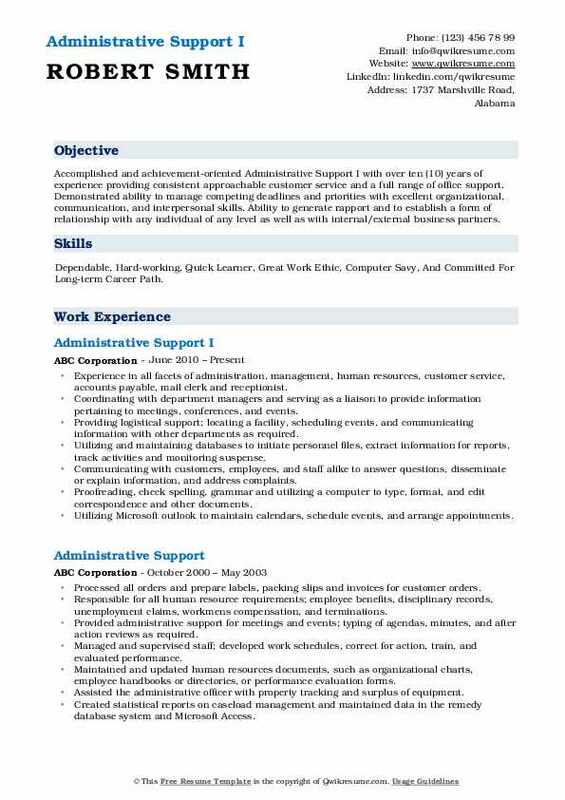 Administrative Support roles and responsibilities include providing administrative support to the office to ensure efficient operations. Common work activities included on the Administrative Support Resume include the following – supporting managers and employees, answering and directing phone calls, organizing and scheduling meetings, maintaining contact lists, ordering office supplies, booking travel arrangements, submitting and reconciling expense reports, providing general support to visitors, developing and maintaining filing systems, and assisting in preparation of reports. 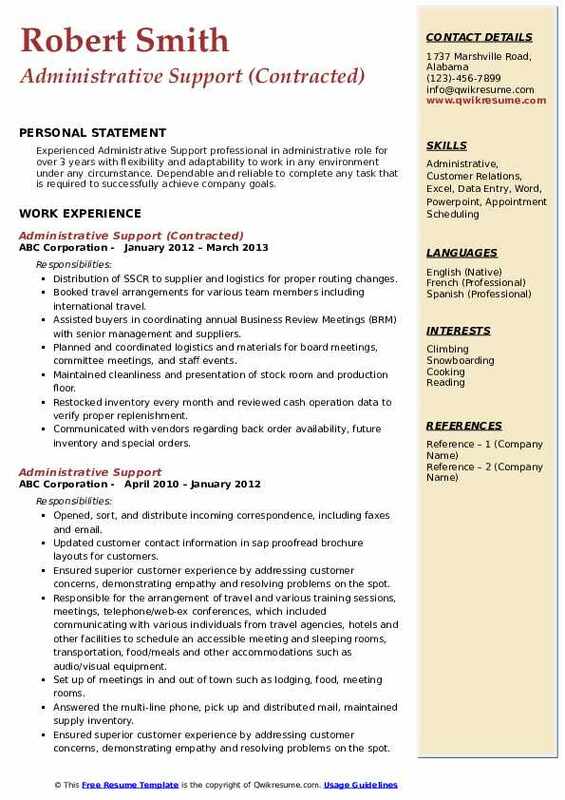 A well-drafted resume should mention the following skills and attributes – knowledge of office management systems and procedures, attention to details, working knowledge of office equipment, proficiency in MS Office, and the ability to multi-task. While a high school diploma or GED is enough to get into this job, possessing additional qualification as a secretary or administrative assistant will prove to be resourceful. Objective : Highly accomplished and determined professional with proven track record of rapport-building, resourceful problem-solving and communications skills. 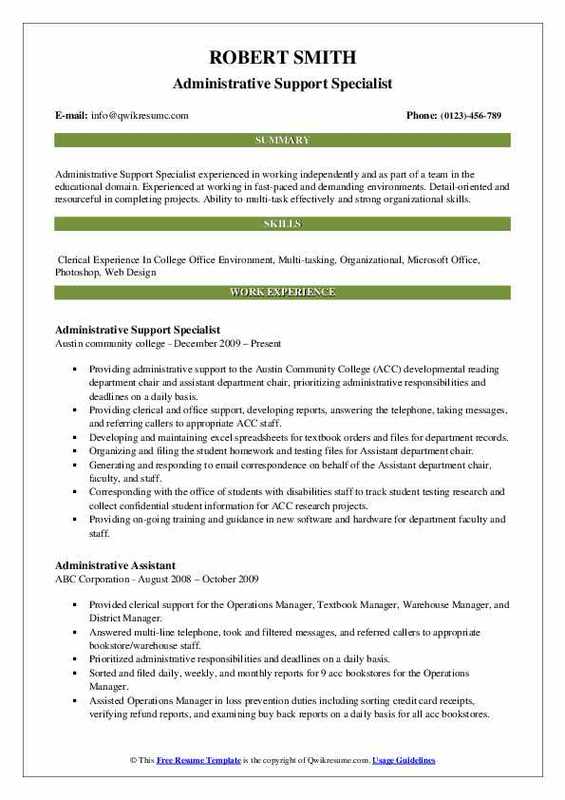 Seeking to apply my education, experience and skills as an Administrative Professional. Checking and informing the patient and key staff about the patient's monetary status. Maintaining security of treatment center funds and providing financial reporting. Completing weekly reports and emailing them to the COO, the Regional Director, Program Director, and Accounting Department. Be able to efficiently use the treatment center's computer program for patient fee collection and financial accountability. Admitting and discharging the patients from the central registry to include preparing and submit state-mandated central registry reports following Program Director review and approval. Assisting the Program Director in correcting patient/counselor caseload listings on a weekly basis or as needed. Running work-related errands as needed such as preparing and taking mail to post office and/or delivering bank deposits. Summary : Administrative Support Assistant VII with over 25 plus years clerical, secretarial and administrative assistant experience. Experience in performing a variety of general office clerical tasks and presenting secretarial support. To find a full-time, long-term career in a business or marketing related field. Creating, filing and maintaining/updating confidential inmate records. Duties included, but were not limited to, the following: purchase requests-typing up and correctly coding bills given to be paid and sent to purchasing for payments to be made. Assisting others in stamping and coding their p-card purchases as well. Answering of the multi-line phone, pick up and distributing of mail, maintain supply inventory. Soley in charge of client surveys; mail-outs, mail-ins, keeping client address info up to date along with the incoming surveys, keeping track of and adding survey info into the snap program via computer. Verifying by telephone, appointments that recipients have made and have kept. Retrieving fax transmissions from the fax machine, organizing them and distributing them in a timely and priority order. Performing back-up phone coverage for the customer services representatives. Summary : Administrative Support Specialist experienced in working independently and as part of a team in the educational domain. Experienced at working in fast-paced and demanding environments. Detail-oriented and resourceful in completing projects. Ability to multi-task effectively and strong organizational skills. Providing administrative support to the Austin Community College (ACC) developmental reading department chair and assistant department chair, prioritizing administrative responsibilities and deadlines on a daily basis. Providing clerical and office support, developing reports, answering the telephone, taking messages, and referring callers to appropriate ACC staff. Developing and maintaining excel spreadsheets for textbook orders and files for department records. Organizing and filing the student homework and testing files for Assistant department chair. Generating and responding to email correspondence on behalf of the Assistant department chair, faculty, and staff. Corresponding with the office of students with disabilities staff to track student testing research and collect confidential student information for ACC research projects. Providing on-going training and guidance in new software and hardware for department faculty and staff. Creating power point presentations utilizing graphic arts software: adobe photoshop and adobe illustrator. Corresponding and communicating with publishing representatives and ACC textbook & bookstore managers for all ACC campuses enforce department guidelines and textbook standards and maintaining the department approved textbook list for faculty reference. 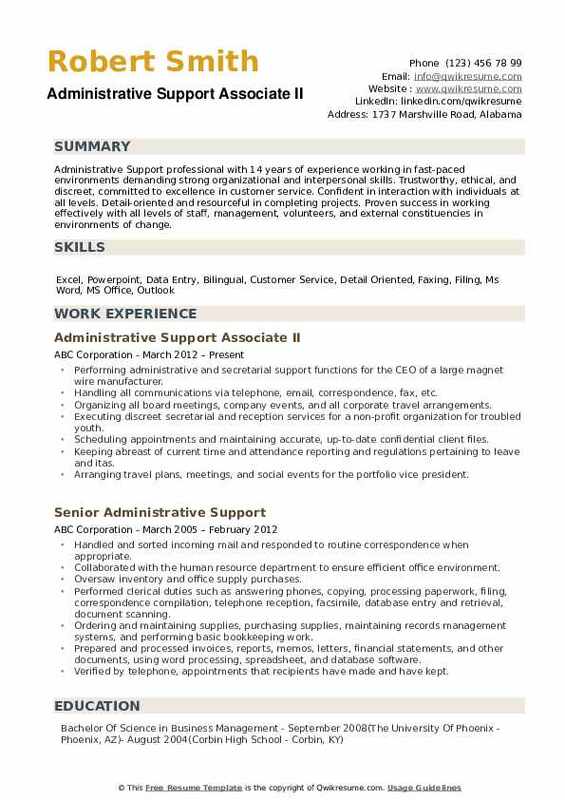 Headline : Senior Administrative Support with 6 plus years of experience is looking to utilize the administration, technical and management skills to obtain a senior level position with room for advancement. Skills and Other Accomplishments Strong computer skills including MS Excel, Word, PowerPoint, Publisher, Outlook and Adobe Acrobat Excellent filing and organizational skills Excellent verbal and written communication. Provided OB/Gyn with general clerk duties including entering patient ultrasound information for physicians and staff. 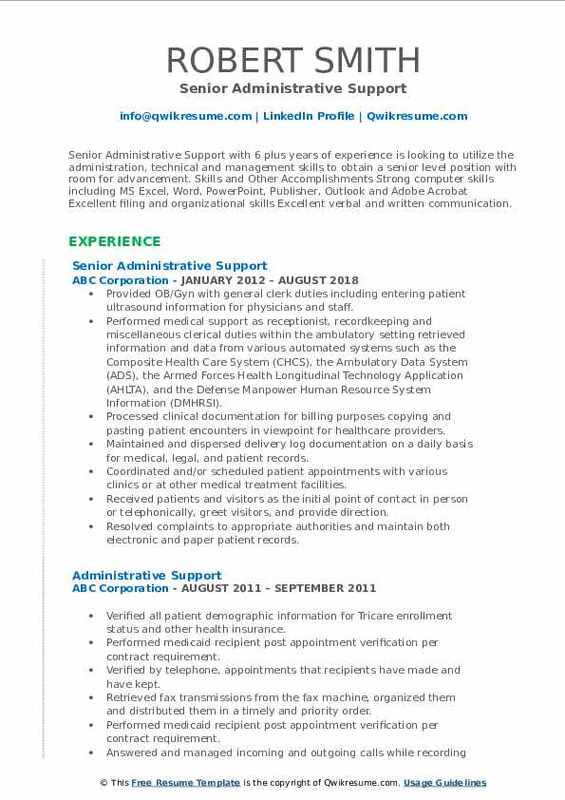 Performed medical support as receptionist, recordkeeping and miscellaneous clerical duties within the ambulatory setting: retrieved information and data from various automated systems such as the Composite Health Care System (CHCS), the Ambulatory Data System (ADS), the Armed Forces Health Longitudinal Technology Application (AHLTA), and the Defense Manpower Human Resource System Information (DMHRSI). Processed clinical documentation for billing purposes copying and pasting patient encounters in viewpoint for healthcare providers. Maintained and dispersed delivery log documentation on a daily basis for medical, legal, and patient records. Coordinated and/or scheduled patient appointments with various clinics or at other medical treatment facilities. Received patients and visitors as the initial point of contact in person or telephonically, greet visitors, and provide direction. Resolved complaints to appropriate authorities and maintain both electronic and paper patient records. Screened patients for Tricare eligibility and assess patient's medical condition to schedule urgent and emergency care. Headline : A creative Administrative Support professional proficient in prioritizing and completing tasks in a timely manner, yet flexible to multitask when necessary. Customer focused with diverse industry experience including design, print production, video production, and administration. Eager to learn new programs and processes. A team player who is attentive to detail and able to work in a fast paced environment. Excellent oral and written communication skills. Skills : Able To Type 45-50 Wpm, Operate PC, MAC, MSWord Outlook, MS Excel, And PowerPoint. Reviewing the safety hazard surveillance walks to identify potential safety hazards and implementing proper procedures and corrections in order to maintain a safe environment for both staff and patients. Coordinating multiple safety drills to ensure staff is prepared for a medical emergency, natural disaster, etc. Monitoring refrigerator temperature logs, monitoring vaccine inventory and performing audits on medical assistants to ensure proper documentation in-patient EHR and CAIR systems and maintaining open lines of communication with MAs. Ensuring inventory is well stocked by completing weekly inventory counts and processing monthly vaccine orders. Providing support to administrative staff by running reports on patient care measures, assisting in patient scheduling transcribing patient, clinical and insurance phone calls for review and proper documentation in EHR. Responsible for issuing petty cash to both medical and dental clinic and collecting and ensuring timely bank deposits are made. Providing support to medical assistants with proper ICD-10 codes for documentation into EHR. Summary : Accomplished and achievement-oriented Administrative Support I with over ten (10) years of experience providing consistent approachable customer service and a full range of office support. Demonstrated ability to manage competing deadlines and priorities with excellent organizational, communication, and interpersonal skills. Ability to generate rapport and to establish a form of relationship with any individual of any level as well as with internal/external business partners. 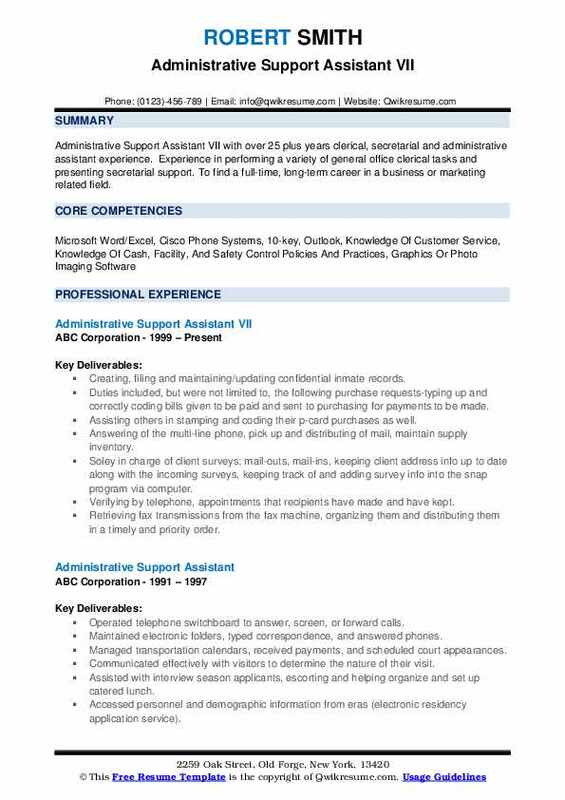 Skills : Dependable, Hard-working, Quick Learner, Great Work Ethic, Computer Savy, And Committed For Long-term Career Path. Experience in all facets of administration, management, human resources, customer service, accounts payable, mail clerk and receptionist. Coordinating with department managers and serving as a liaison to provide information pertaining to meetings, conferences, and events. Providing logistical support; locating a facility, scheduling events, and communicating information with other departments as required. Utilizing and maintaining databases to initiate personnel files, extract information for reports, track activities and monitoring suspense. Communicating with customers, employees, and staff alike to answer questions, disseminate or explain information, and address complaints. 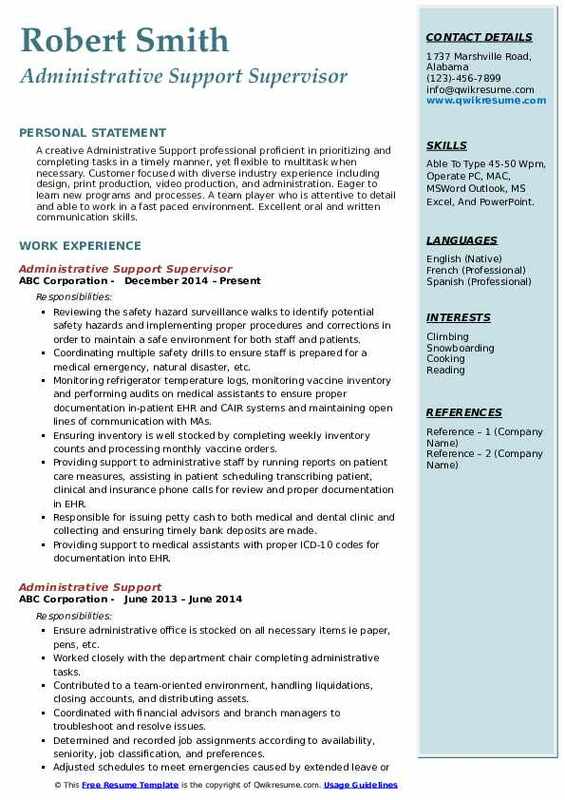 Proofreading, check spelling, grammar and utilizing a computer to type, format, and edit correspondence and other documents. Utilizing Microsoft outlook to maintain calendars, schedule events, and arrange appointments. 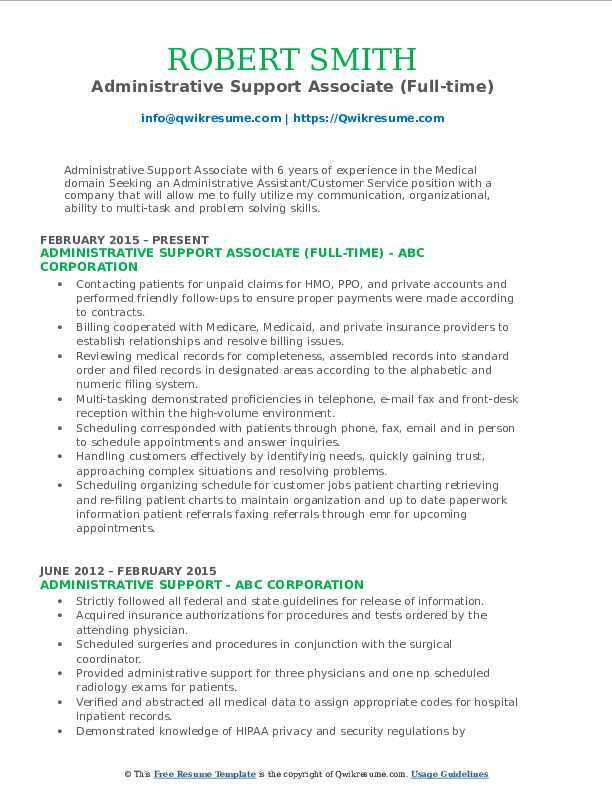 Headline : Administrative Support Associate with 6 years of experience in the Medical domain Seeking an Administrative Assistant/Customer Service position with a company that will allow me to fully utilize my communication, organizational, ability to multi-task and problem solving skills. Contacting patients for unpaid claims for HMO, PPO, and private accounts and performed friendly follow-ups to ensure proper payments were made according to contracts. Billing cooperated with Medicare, Medicaid, and private insurance providers to establish relationships and resolve billing issues. Reviewing medical records for completeness, assembled records into standard order and filed records in designated areas according to the alphabetic and numeric filing system. Multi-tasking demonstrated proficiencies in telephone, e-mail fax and front-desk reception within the high-volume environment. Scheduling corresponded with patients through phone, fax, email and in person to schedule appointments and answer inquiries. Handling customers effectively by identifying needs, quickly gaining trust, approaching complex situations and resolving problems. Scheduling organizing schedule for customer jobs patient charting retrieving and re-filing patient charts to maintain organization and up to date paperwork information patient referrals faxing referrals through emr for upcoming appointments. 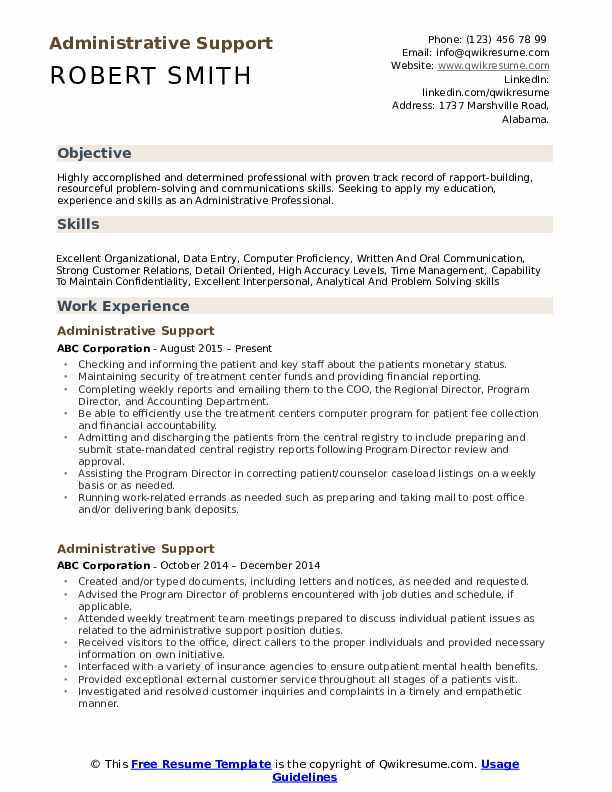 Objective : Junior Administrative Support professional committed to quality service and performed responsibilities with professionalism & ethics even under extreme pressure while implementing established standards and procedures. Key Strengths Excellent Organizational skills. Developed specific goals/plans to prioritize, organize, and accomplish work. Recognized for cross-discipline talents in needs analysis and problem resolution in fast paced environments. Skills : Microsoft Office Word, PowerPoint, Excel, Outlook, internet search engines, and 10 key by touch. Typing skills: 120 wpm / 7,000 kph. Providing a variety of administrative and staff support services for NW regional and National Department and across business lines for appraisal, construction, environmental, and evaluations products. Conducting monthly and quarterly production reporting for the national department. Collecting and interpreting data to produce reports based on specifications of upper-level management. Providing monthly quality assurance reporting and invoice reconciliation for NW regional team. Using Microsoft Office products to produce additional reports and conduct special projects. Designing, formatting, and editing the quarterly department newsletter using Microsoft Office products. Recognized by management for going above and beyond assigned duties to aid the team. Creating, preparing, typing, and distributing the weekly reports to managers and other selected personnel. 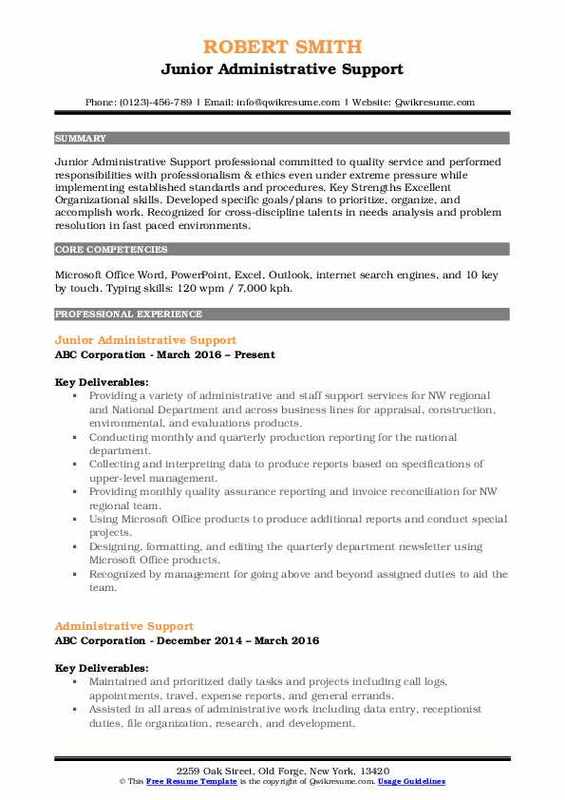 Objective : Experienced Administrative Support professional in administrative role for over 3 years with flexibility and adaptability to work in any environment under any circumstance. Dependable and reliable to complete any task that is required to successfully achieve company goals. Distribution of SSCR to supplier and logistics for proper routing changes. Booked travel arrangements for various team members including international travel. Assisted buyers in coordinating annual Business Review Meetings (BRM) with senior management and suppliers. Restocked inventory every month and reviewed cash operation data to verify proper replenishment. Prepared responses to correspondence containing routine inquiries and invoices. Summary : Administrative Support professional with 14 years of experience working in fast-paced environments demanding strong organizational and interpersonal skills. Trustworthy, ethical, and discreet, committed to excellence in customer service. Confident in interaction with individuals at all levels. Detail-oriented and resourceful in completing projects. Proven success in working effectively with all levels of staff, management, volunteers, and external constituencies in environments of change. Performing administrative and secretarial support functions for the CEO of a large magnet wire manufacturer. Handling all communications via telephone, email, correspondence, fax, etc. Organizing all board meetings, company events, and all corporate travel arrangements. Executing discreet secretarial and reception services for a non-profit organization for troubled youth. Scheduling appointments and maintaining accurate, up-to-date confidential client files. Keeping abreast of current time and attendance reporting and regulations pertaining to leave and itas. Arranging travel plans, meetings, and social events for the portfolio vice president. Providing exceptional internal service supporting the Office Manager and Assistant Office Manager as well as four different providers on a variety of tasks.